Dediscated to the God highly worshipped in Southern India, Lord Murugan, the Kandhakottam Temple or the Kandaswami Temple is located in the vicinity of another popular Chennai attraction, Fort Saint George. Several schools and colleges across Chennai are associated with the temple for cultural activities like music and dance classes. The main deity in this temple is the 'Shri Kandha swami' that was got here all the way from ‘Thiru porur’. This vibrant temple is a great visit in all the frenzy of the buzzing Park town. How popular is Kandhakottam Temple? People normally club together St Andrew's Church and Sowcarpet while planning their visit to Kandhakottam Temple. People also prefer to start their day with Kandhakottam Temple. 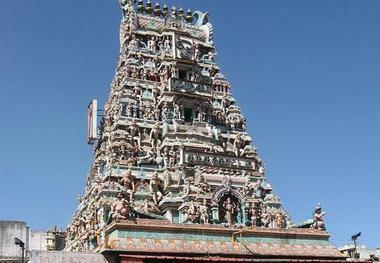 It's a traditional and holy place to visit and the main god here is lord Murugan. If visit the temple regularly lot of good things will happen. It's located in a very narrow street if u want to visit this place go by public transport port and it's very near to Chennai fort railway station and near to high court bus stop. It should not be visible from normal traffic . Nice temple. Gets over crowded on auspicious days due to less space. Located in a narrow street. Can get parking on main road in the morning before the shops open. Such a lovely temple. You can visit on normal days so that you can dharshan easily and peacefully avoid going on peak hours and special days you will get ruined with traffic and Crowd. Divine place. Murugan temple in the heart of the city. Very narrow street's and can't believe it a huge temple in parrys corner. Reaching the temple in 2 wheeler or auto is best. No car parking facility's and it's very tough to drive inside the street's. Better park in the main road and walk. U can do whole sale shopping in the nearby area's. Quality item's at cheap prices. It is in the hub of the Chennai Downtown with heavy traffic conditions - even pedestrians find it difficult to move about with so many commercial concerns selling every thing on earth at whole sale rate. Kandhakottam temple dedicated to Lord Murugan.All people of Park town , Sowkarpet, Mint Street, Esplanade, NSC Bose Road are regular visitors to this temple apart from the other people visiting this market area.